Sunday, we took a little trip to Crossroads Village & Huckleberry Railroad with the goal of finding some interesting photos. This pink oil can sat on the Masters Cider Mill's older steam engine which originally came from one of the GM plants in Flint. 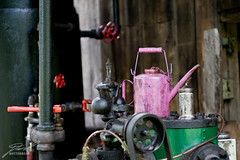 Pink just isn't a color you'd expect to see near steam power though.